Has Gabriel Sherman Made Common Cause with Candidate Trump? Trump steamed in private while reading a report by CNN media correspondent Brian Stelter that Trump felt took a pro-Fox slant. “We resolve this now or go to war,” the piece quoted Ailes saying. Trump, according to a friend who spoke with him, felt Ailes was spinning in order to damage him. The sources for this story contradicted New York magazine’s assertion that Ailes called Trump repeatedly and “begged” the candidate to tweet that they’d settled their feud. “Neither of them would beg for anything,” one of the sources said. Ah, so Stelter’s sources contradicted Sherman’s reporting. What better way for Sherman to rehabilitate his own rep than to go back to the Trump well to reinforce his side of the story? No one—none of the rival candidates, none of their armies of highly paid political consultants, not even Fox News chairman Roger Ailes or his boss, Rupert Murdoch—has engineered a strategy to effectively handle Trump. Ordinary candidates might have to print up campaign literature to get a profile like this published. New York magazine gave it to him for free. 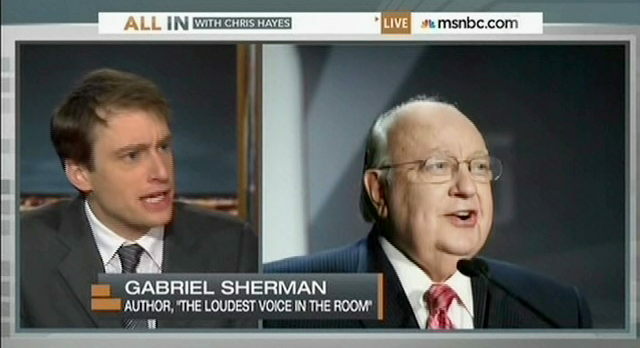 Meanwhile Sherman goes on MSNBC to proclaim Trump is “more in sync” with the Fox News audience than Ailes is, even as “out of sync” Fox News continues to crush the competition by huge margins. You have to believe The Donald is thrilled with the turn Sherman’s coverage has taken. And that gives The Cable Gamer pause. On CNN, Fox Is a “Perfect” Example…of Something They Didn’t Do!